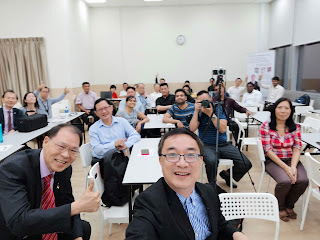 Most so-called WeChat training in Singapore are actually not really training but previews to sell WeChat Official Account consultancy programs. As we know, many companies are crazy about entering the China market. Many people heard that to enter China market you need to use WeChat official account so that you can broadcast to the China market. But we know that there are at least 1.2 million China official accounts and 99% of them are white elephants with few people reading and following them. This is because it is very easy to set up an official account but very difficult to maintain it like you to have updates in your official account. But the consultancy fee for setting up China official accounts are quite lucrative, easily range from S$3,500 to S$9000. That explains why so many so-called 'WeChat trainers' are happy to conduct free WeChat training so that they can earn the fat fees from the China official accounts.